Progress Lighting Alpha Trak® Collection Round Back Collection Contemporary/modern style track head ceiling light in white finish, features steel construction. This ceiling light uses one 50-Watt incandescent lamp that has PAR-20 or R-20 socket. Lamp has voltage rating of 120-Volts. It measures 3-1/2-Inch x 7-1/4-Inch. 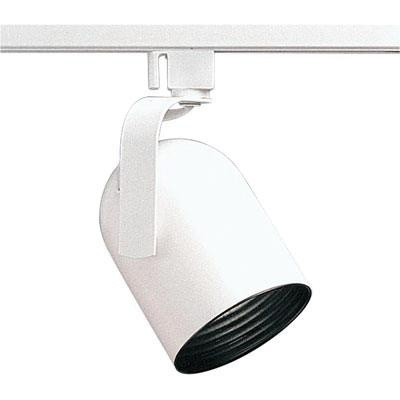 This ceiling light offers 1-Circuit track mounting for simple and easy installations. This ceiling light features quarter locking action for adjusting turn and tab locks to avoid accidental removal. This track head ceiling light supports 358-degree horizontal rotation and has self-locking pivot for vertical head positioning. It is suitable for kitchen and room lighting. It comes with phenolic black baffle and spring retention clip. Ceiling light is UL/cUL listed. * Inventory displayed is accurate as of 04/18/2019 05:40 EDT.